And it looks fine till it gets drawn then you can see the twist in the limbs. First time to view this, very helpful post. I'm rather late commenting to this good thread but I like it.I'm sure it'll help many future bow makers out there. Wow, good thread. This is really helpful. 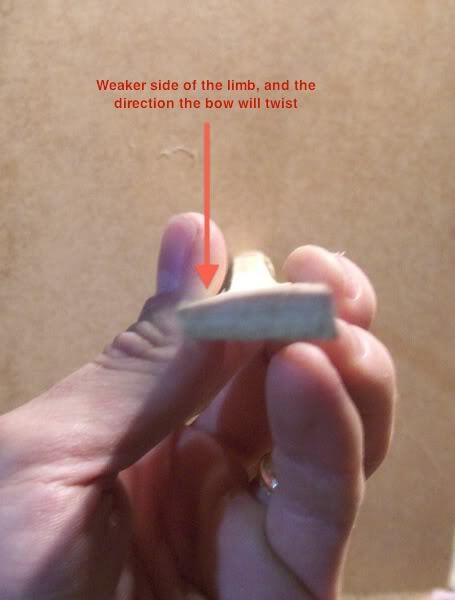 With board bows, limb twist can also be caused by the wood fiber not following the center of the limb as it would in a split stave. 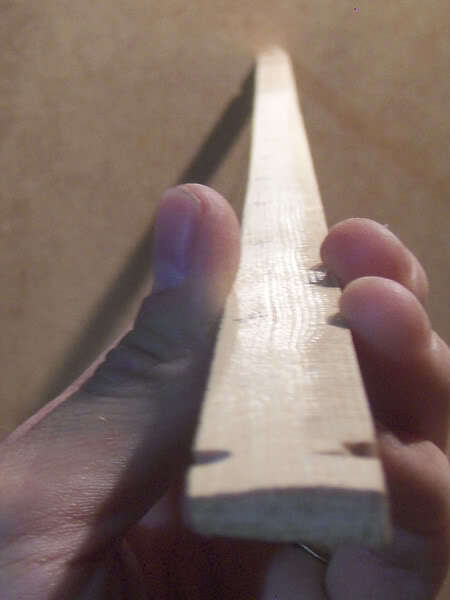 Sometimes this is hard to see by visual inspection of the original board as it can occur in boards where all the growth ring lines appear straight. This is caused by the tree twisting as it grows. In tropical hardwoods it twists in reverse for half the year. The fix for this is to laminate the bow with two consequent slices of the same board and flip one over so that when the two lambs are laid side by side they are mirror images. Tiller by filing scraping sanding--no planes. Try to plan your design so that each lam is a similar thickness and the limbs will bend straight with some use of the above method. I've been noticing several folks posting questions about how to correct limb twist. It seems like a simple concept, but it's deceiving. As such, I've photographed a little experiment to help illustrate the mechanics at work when the limbs are twisted, and thus how to correct it. I took a simple pine slat and planed one face (the belly of the "bow") at an angle, thus creating a obvious weak strong side to the limbs. I then strung up the "bow" and clamped it flat to the workbench. Because the back was left true, any limb twist would be easily seen. I placed a square at the far end of the picture for easy reference. The weak side of the limb has been marked with X's. As you can see, the limbs are twisted TOWARD the weak side. 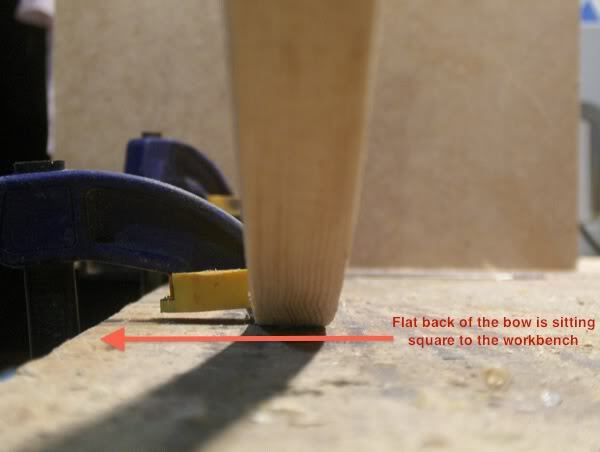 Therefore, to correct the twist one must remove wood from the strong side, which is OPPOSITE the direction of the twist. For me, at least, this is counterintuitive. As such, I have a diagram that hangs in my shop just to remind me of the mechanics at work. Although it might seem that the strong limb would pull the weak limb (creating a twist in the direction of the strong limb), the opposite is true. The weak limb doesn't have the strength to resist the strong limb, and thus twists under the load. I think some of the confusion about which side to remove wood from is due to the fact that you actually CAN remove wood from either side. Let me try to explain my understanding, with some crude Homer Simpson type drawings I scanned. Here's an example. When strung, this limb is twisting to the right of the imaginary center line. This means that the right half of the limb is the weak side, the left half is the strong side. Thank you loon! saved this post, since the images are now deleted. I did the same experiment and got the same results http://www.primitivearcher.com/smf/index.php/topic,61383.0.html. I also show how the back raises on the strong side (or belly raises depending if you're looking at the back (string down) or belly (string up). So remember, if you're looking at the belly during tillering, DON'T take wood off the side that raises up, no matter how tempting it is to "try and flatten it down". Page created in 0.76 seconds with 27 queries.